Tucked quietly away down a meandering country road just west of Mt. Pleasant, Michigan is Riverwood Resort. 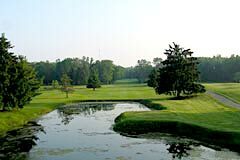 Nominated as one of the top resorts in Michigan, Riverwood boasts 27 holes of golf and is host to the oldest, longest running junior golf tournament in the state. 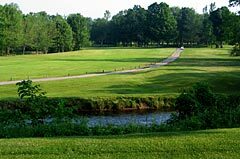 Running through the property is the Chippewa River - a water hazard that players have to negotiate on several holes. That, along with subtle elevation changes and mature woodlands, round out Riverwood's unique standing in the Mt. Pleasant golfing community. A fully stocked and well staffed pro shop is on property along with a great dining facility that offers patio dining as well as banquet and special event hosting (up to 180 people). A driving range with target greens as well as a practice green are on property. 8 fairway villas offer accommodations to duffers who wish to stay and play and a 24 lane bowling facility provides entertainment apres golf. Kudos to Riverwood for using a windmill for supplementary power. For more information on Riverwood Resort - click here. Three courses comprise the golf facility at Riverwood. The Blue course is a short 9 hole resort course that provides a great warm up (yardages from two sets of tees run 2232 and 2027). We reviewed the White & Red courses that have been rated as an 18-hole championship course. The back tees play 6596 yards and have a rating of 72.5 with a slope of 136. Our review is based on the middle tees - 6154 yards with a rating/slope of 70.0/127. The forward tees are 4957 yards and have a rating of 69.6 with a slope of 120. Riverwood uses the flag system to indicate pin placement: red= front, white = middle and blue = back. While some sprinkler heads are marked, yardage plates are located on the fairway at 200, 150 and 100 yards and a 150 yard stake is located on both sides of the fairway. The opening hole sets the pace at Riverwood and demands a carry over water from all of the tee boxes. 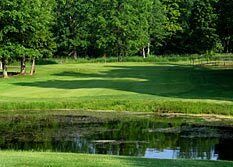 This 402 yard par 4 is the first of the holes to make use the Chippewa River as a hazard which comes into play at about 153 yards out. The approach over water is to an elevated green with mounding behind. The second hole is a shorter par 4 at 374 yards. The landing area off the tee is narrow but opens up after the 200 yard marker. Par 4 dogleg right follows where any shot hit right at about 150 yards offers a good look at the green. An approach shot over water would put the ball on the green in 2. The fourth hole is a par three with a very small landing area behind a rock wall on the right. Anything hit left will find trouble and the green is very undulating and sloped back to front. The first par five on the course is 528 yards and the fairway is long and narrow. Tee shots hit left will find trouble in a densely treed area. The fairway begins a climb at the 200 yard marker where you can see the very large green with a large bunker in the front. Another long par 5 with a dogleg right and large trees intruding on the narrow fairway not far off the tee. Serious trouble on the right begins at the 200 yard markand the turn begins at about 150 yards. Sand is a surprise for approach shots missed left. Number seven is a beautiful par 4 with a water carry off the tee. Anything hit near the 150 yard marker should be safe. The fairway is very narrow with lots of trouble - bunkers, mounding and water. The large green is a distinct kidney shape with the toughest pin placement being back right. Elevated tees offer a great view of this par three with water guarding the right. The green is long and narrow with a slight right back to left front slope. Any pin placement center to right will demand a water carry off the tee. The closing hole is a 325 yard par 4 with water everywhere. Tee shots must carry water and should be to the right of the fairway at about 150 yards. Water is present along the entire left side of the faiway but the landing area is sufficient and a birdie opportunity exists for those who hit anywhere between the 150 and 100 yard markers. The approach is over water to a green that is mounded in the back with right greenside bunkers. The tee shot on the par 4 10th hole is over the river to a narrow fairway fringed by a somewhat forgiving rough. Large trees border the fairway at the turn which is 150 yards out. The approach is to a slightly elevated green. A par 3 with trouble everywhere follows. Water is on the right and large trees are on the left. Greenside bunkers front and left protect this postage stamp green. Par is a good score here. On number 12 an uphill teeshot anywhere in the 200 yard range will put you at the turn. The fairway is expansive from the turn to the green which slopes slightly left back to right front. A perfect tee shot would be left at around 225 yards. A wide open, undulating fairway with lots of uneven lies is next, with fairway bunkers at around 200 yards being the only problem, followed by a very pretty little par 3 with a small pond carry and water on the right. Number 15 presents a very right tee shot to a fairway that appears narrower than it actually is. A shot hit right to about 250 yards would make a birdie possible on this hole. The sixteenth hole is a long, straight grip it and rip par 5. The fairway is quite expanswive with only one small finger of rough protruding onto it at about 250 yards. The green is small and slopes back to frong offering the only difficulty on this hole. 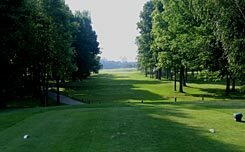 Seventeen is a long par 3 through a large growth of mature hardwoods. The narrow fairway approaches a slightly elevated green. The closing hole is a gorgeous par 4 over the river to a very elevated green that slopes back to front. Club up all the way on this great closing hole. Riverwood is a wonderful property and a great value. The staff is very friendly, courteous and helpful. We enjoyed meeting one of our Two Guys Who Golf customers from Canada who was staying and playing at Riverwood during our review there.. He assured us that the digs were great and that he and the rest of his golfing party were having a great time. Other activities include the Soaring Eagle Casino in Mt. 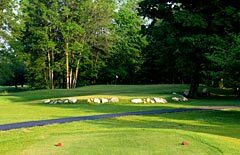 Pleasant and for golfing parents of students who attend Central Michigan University - the resort is just a mile or two down the road - a great place to stay & play while visiting the kids! For more detailed information, directions, green fees and a link to Riverwood's website, visit the Two Guys Who Golf informational page by clicking here.